How Do I Cleanse My Feng Shui Crystals? It is important to cleanse your feng shui crystals more or less regularly, as most crystals will absorb negative energy from their surroundings. This is one of the reasons crystals are so powerful, as they have strong protective and healing energies. Once a crystal has absorbed many lower vibrations, it needs help in releasing them so as to function to the best of its abilities. Usually, you will sense when crystal needs healing, especially if this relates to crystals used on your body (i.e. in jewelry or in laying on healing). The stone will not sparkle as brightly as it used to, it will look and feel dull. This will also relate to feng shui crystals used in areas of your home that have lower energies; the crystals placed there will need cleansing more often. So, how do you cleanse your feng shui crystals? My answer will have two parts. First, you need to know when or how often to cleanse your crystals. Second, you need to know how to cleanse crystals, to find a way of cleansing crystals that is convenient and easy for you. Until you feel more attuned to your crystals and can sense when they need cleansing, plan to cleanse your crystals every other new moon. Just mark in your calendar the dates for new moon and plan to cleanse your crystals accordingly. The time around the new moon is best for cleansing crystals because it has very gentle energy for healing, as well as for setting your intentions. Once you feel more connected to your crystals, you will intuitively sense when they need cleansing. There are many methods for cleansing crystals. In feng shui, the term cleansing crystals means cleansing that goes beyond washing the surface of the crystal. Proper cleansing of a crystal means helping the crystal release negative energy vibrations that the stone has accumulated from past owners or past places. It also means cleansing the crystal from the lower energy vibrations that the crystal has absorbed from your body or from your home or office environment. Here are several ways of cleansing your crystal. 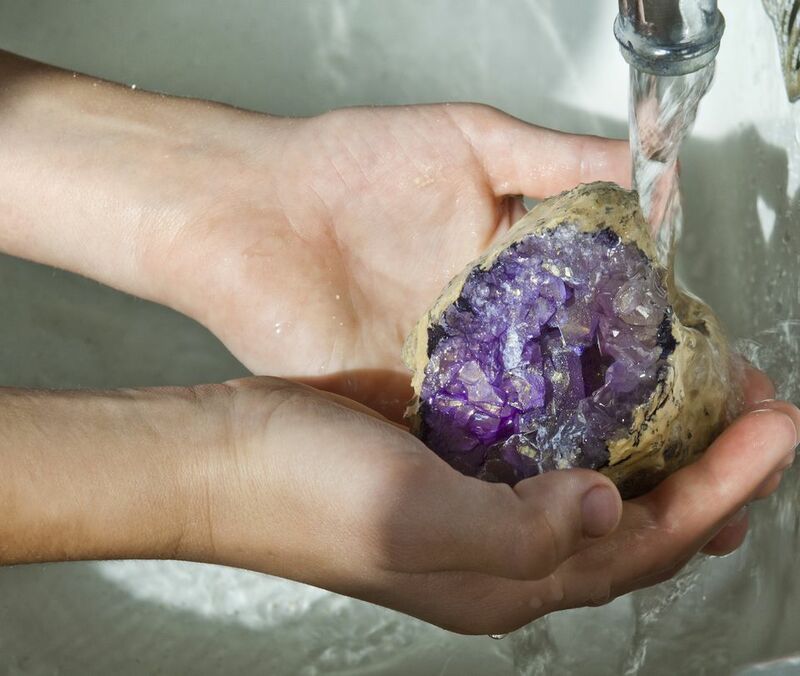 First, wash your crystal well under cool running water. Second, place it in a container made from natural material such as glass, or clay. It is best to avoid metal or plastic containers. Fill the container with water and place several teaspoons of fine sea salt. Next, you will place the container with crystals outside, under the new moon where all the surrounding natural elements - cool air, the wind, the moon and the stars - will promote the rejuvenation process. If you cannot place it outside, place the container on your windowsill. I usually cleanse my crystals in the late afternoon and place them under the setting sun when the energy feels very gentle and peaceful, then keep them outside through the night to absorb the soothing new moon vibrations. The next day, I will conclude the healing by removing the crystals from the container and discarding the water. I wash the crystals under cool running water again and then let them air dry. Sometimes I will place them in the morning sun for an hour or so. It is good to set clear intentions for your crystals at this point. Alternative methods of crystal cleansing include running them under a natural stream of water, smudging them or, in case you feel your crystals need strong healing, burying them in the earth for a specific amount of time. You can also use visualizations to heal your crystal or immerse it in a bowl with herbs, either fresh or dried herbs. If you have different types of crystals, it is usually best to cleanse them in separate containers and not mix them together in the same bowl. 1. I am aware of only two crystals that do not need cleansing because they do not hold or accumulate negative energy. These crystals are citrine (natural, non-radiated) and kyanite. 2. Some crystals are best not placed in the strong sunlight to preserve their deep colors. This especially applies to amethyst. 3. Depending on the healing the crystal needs, you can choose a different moon phase, such as several days in the waning moon cycle, for example. 4. Be extra careful not to damage the points of crystal towers or double terminated crystals. Cleanse them separately from tumble crystals. How Is Clear Quartz Crystal Used in Feng Shui? Feng Shui Crystals and Stones: Letters "P" to "Z"